If hype is something to be trusted, then Rachel Held Evans’ new release Searching for Sunday promises to be one of the most influential publications in pop theology this year. For a long time I’ve followed Evans’ career with abstract interest. I’ve not read much of her work for no reason other than a lack of available time. But I’ve admired Evans nonetheless. One does not need to be a football fanatic to appreciate the prominence of Tom Brady or Aaron Rodgers. And I’ve often felt the same way about Evans. She is unique. She’s different. She’s provocative in a love-’em-or-hate-’em kind of way. And she’s a necessary voice rising above the status quo, speaking into the realm of western theology which all too often is an Anglo-Saxon sausage fest. For that alone, I hold Evans in high esteem. And in following the recent buzz around Evans’ new book, particularly in this interview with HuffPost Religion‘s Zach J. Hoag, I’m really excited. I’m excited because her views are refreshing. I’m excited because her insights are creative. I’m excited because her assertions are transparent. But mostly, I’m excited because her theology rings of orthodoxy. This isn’t news. Or at least it shouldn’t be. Church attendance has been and is rapidly decreasing. Denominations are dwindling. A majority of what is reported as “church growth” is really church cannibalism; other congregations gaining the remnants of faltering parishes. The American church is dying. And denial can only bail the boat out for so long. “Death is something empires worry about…not something resurrection people worry about (…) my hope is that, if the American church must ‘die,’ let it ‘die’ to the old ways of dominance and control and be resurrected into the way of Jesus, the way of service and sacrifice. It’s statements like this that incite a conniption fit to advocates of the Moral Majority. And it underlies a deep tension among older generations in American churches. We are moving out of the era of “Christendom.” The opinion of the church is no longer a commanding presence in society. America is no longer a Christian nation (not that it ever was). Churches that once attracted converts are now in the headlines for their collapse and decay. Evans’ herself has experienced the cycle of church life through her involvement with a church plant that eventually closed its doors. The question is not whether or not the American Church will die, but too what will the church be resurrected? In other words: what will the death of American Christendom mean for the future worship of Christians who happen to be American? At first glance, Evans’ statement rings of inclusivism, of relativism and everything (we’ve been taught is) evil about postmodernity. But, truth told, this is an orthodox way of approaching faith. Evans’ proposes a form of Christianity that does not die on our mountains of propositions regarding who God is (ie: pro-life, Republican/Democratic, pro-America, pro-family…etc) but is rather held by the faith that there are certain things God isn’t (evil, unjust, dead, absent, etc). We can say with absolute certainty that there are some things God is not but the nuances of who he is are simply questions that spend our lives trying to figure out- so why not ask them together? And perhaps Evans pushes the envelope a little to much at such points. But perhaps not. There’s something to be said for the American church needing more of Zaccheaus & Mary Magdalene and less of the Pharisees. And, on her worst day, I would align Evans with the former. And this lays the foundation from where Evans’ orthodoxy hits home. Being the disillusioned Christian that she is, the last thing I expected to find in Evan’s Searching for Sunday‘s Table of Contents was a book organized according to the seven sacraments! I left an Anglican church to go to seminary. Today I attend a beautiful church with beautiful people. We sing along to Hillsong renditions. We listen to thoughtful and profound sermons. But worship doesn’t feel complete. Because we only take communion once a month. We don’t use a liturgy. There’s no daily confession, no responsive reading of the Psalms. The service ends in time for us to grab lunch and catch the game. It ends with a benediction. It ends with us leaving the sanctuary- but there’s no body and blood for nourishment and no procession paving the way. Which is not to say any of this is a bad thing. But it’s worth pointing out that I – and, statistics will tell you, many in my generation- leave these services, sometimes feeling a little empty. Because there’s an identity attached to the tangible nature of the sacraments. The Lord’s Supper is a very real event. This is not a Catholic notion; Luther and Calvin both espoused the significance of the event in the life of a Christian. It was not merely a remembrance but an act, a celebration; an articulation of the grace of Christ into the practical, everyday needs (food and drink) of the believer. In the Lord’s Supper, grace has a taste, a feel, a scent. It’s something real that I can hold in the palm of my hand. If I come to church after a week of being unable to read the Bible, a week when I’ve sinned gregariously, a week following which I’m feeling undeniably broken, lost and stumbling, desperately looking for Christ, after that week I can still “taste and see that the Lord is good” (Psalm 34:8) as opposed to just hearing a sermon about how good and great he is while my mind is wandering, preoccupied by the past week and burdened with the stress of the days to come. Evans’ relates to this struggle. “Being a Christian,” Evans states, “was (presented to me as) all about believing the right things, finding the right denomination, living the right life.” American Christendom was founded upon the drawing of lines, the explanation and apologetics of salvation, and the “yes” or “no” label it attaches to life, regardless of it’s nuances. But this black-and-white approach to faith fails to translate the reality of grace into a postmodern context. It is not tangible, just theoretical. And what we’re coming to find is that the post-modern individual must be approached by the church as the post-modern person: body, soul, spirit, and mind. Too often the American church acknowledges and cares for the heart or the spirit but in discarding the use of and reliance upon the sacraments they’ve also discarded a spirituality that engages the entire individual, a spirituality that is pragmatic and heavenly. The sacraments connect the grand spiritual experiences of confession with tangible dunking in the water; they connect the sacrifice of Christ and the spiritual nourishment it provides with the actual bread and wine. They bring Christianity down from abstraction to real life. And if Christianity has a hope in a world that is increasingly relational, increasingly emotive, it has to find itself rooted, once again, in real life itself. If Sunday is to be found, then it must be found within an orthodox communion of saints that evolves around the sacramental understanding of faith as a journey, a road on which we all must trod. The sacraments are the foundation from which a faith of open doors and feasting banquets is built. What Barth alludes too, my colleague articulated, and Rachel Held Evans is postulating, is that the way forward requires that first we to step back. The way forward is to return to the beginnings of a movement begun by a poor Galilean hanging on a cross. It’s to erase divisive lines and just eat at the table together. It’s to immerse ourselves in the water of baptism and let it’s cool drops remind us of his grace upon us all; to embrace the act of confession as personal laments, not legislative dogma. Which is where the sacraments become imperative. Because, the sacraments engage the whole person wherever they’re at. Young evangelicals are entering an age of Christendom that is going to force us to settle for orthodoxy. In doing so, we are going to find that orthodoxy does not look like the Christianity we grew up with. Orthodoxy looks like a church that’s always dying. Granted, resurrection is in its future, but its dying nonetheless. It looks like a church filled with beautiful people but ugly sins- awkward sins, despicable sins, sexual sins, societal sins, broken hearts and weeping wounds. It looks like a community of lost people who went searching for Sunday, searching for faith, searching for home, and found ourselves dunked in the water, healed in confession, and feasting at a table in the communion of saints. Now we just want to tell the story in a way that everyone can hear. Because the journey is long but the feast is grand and there’s plenty room for all who may wish to join. 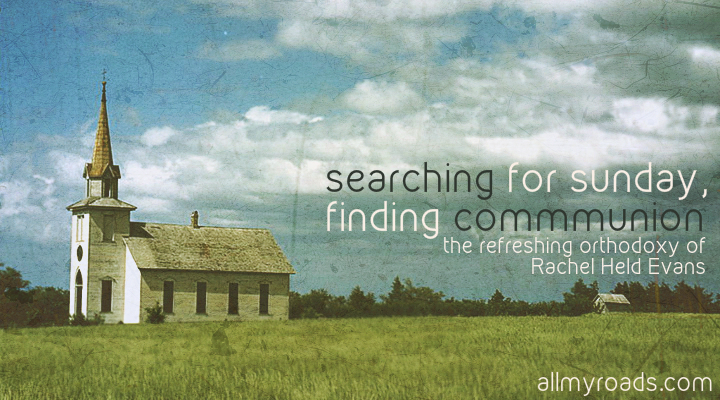 I’m excited because Rachel Held Evans’ is searching for such a faith. And I, for one, want to join her in the journey.